Daily upkeep – Set aside time to work through emails – it’s not about being prescriptive and only checking your emails at set times – this can be risky and there will always be emails that require an immediate response. It is about recognising the need to set aside 30 minutes a couple of times a day to go through the interesting but not so important, the less urgent and the junk emails – makes emails more manageable. Remember – It is not just the inbox that needs a clear out – don’t forget to check your sent emails too. Create mail folders – a little sorting goes a long way, e.g. folders for finance, major clients, venues, etc. Unsubscribe – do you really need or want all the newsletters, advertising emails, etc. you are receiving? A short time spent ‘unsubscribing’ makes for less time spent on emails in the long term. Read carefully – a waste of everyone’s time if you don’t and then keep asking the sender questions for answers that have already been provided. Include important relevant information in the subject line – avoid replying to a previous email and retaining a subject line that refers to a prior discussion. Start a new email – easier for you, and the recipients, to keep track of ongoing discussions. Don’t make hasty replies – the old adage – think before you send! 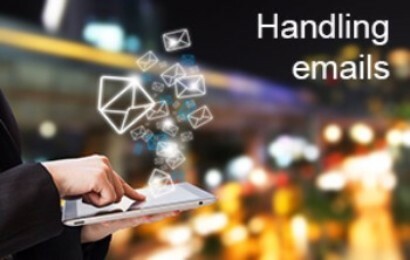 No matter how busy or cross you are – re-read your email before sending it – once the email is sent, it is gone. Consider carefully what you write – emails are a permanent record and can be easily forwarded to others. Or your emails may become disclosable during a legal action or as a result of a freedom of information request. Spell checking – always essential! Quick typing using a tablet or smart phone can lead to interesting errors. Avoid – emoticons, lots of exclamation or question marks and ‘text speak’– not everyone either appreciates them or understands them. Who are you replying to? Mr John Smith or John Smith’s secretary? Be careful – as PAs we sometimes get “interesting” replies because recipients have not checked from whom the email came from. Stop the “cc’ing” – unless appropriate, we inadvertently fill up each other’s inboxes. If you send out an email and copy it to 10 people – you have sent 11 emails! Ask yourself why you are copying the email to everyone. Be clear – don’t bury the purpose of your email in the last paragraph. Do not assume – while concise emails are good, do remember to provide pertinent background information. Email signature – include your contact details – if you are someone people might want to contact other than via email, help them – give them a telephone number and postal address. Remember to include an email signature with contact details in ‘reply’ emails, particularly if you were the recipient of the initial email. Escape! When you are going on annual leave, warn everyone in advance. A couple of weeks before add a note of the dates to your email signature, e.g. “Please note I’ll be out of the office between 21 March and 03 April inclusive” – allows any outstanding issues to be resolved before you go, allows you to relax while on leave and may well mean fewer emails and less issues for when you return! Out of office – do remember to set up your ‘out of office’ email, but equally remember to set (if possible on your system) the start and, most importantly, the finish date/time or, alternatively, turn off your ‘out of office’ when you are back in the office. When giving alternative contact information, do warn your colleagues that you have given their details! Alternatively follow Daimler’s example (BBC 14 August 2014 http://www.bbc.co.uk/news/magazine-28786117) and your ‘out of office’ email will say that while you are on leave, incoming emails will be deleted! Building relationships – Should you phone instead?